This week we will briefly look at specific examples of institutional change in progress or on the verge affecting the city's agencies, old and new. The National Newark Building of 1999 is changed from the original 1929 neoclassical tower topped by a modern reproduction of the Temple of Halicarnassus, which for most of its life has been the most elegant office building in New Jersey. Today its 34 stories, three-floor mansard roof and 121-foot high flagpole are being renewed as one of the tri-state's most attractive buildings. In 1998, Cogswell Realty purchased the building and began a $45 million restoration. It includes fiber optic communication, 16 high-speed elevators, 1,500 new double thermopane windows, new signage, a re-pointed exterior, exterior lighting, and tastefully retouched gold leaf ceilings and inside decor by Hillier of Princeton. During the last decade, five of the 10 neighborhood library branches have been completely modernized, restocked with books and filled with the latest computer technology. Each of these branches—at Hayes Street, Osborne Terrace, Summer Avenue, Van Buren Street and Alexander Street—has become a library showcase in its neighborhood. At the Central Library on Washington Street, the newly opened Victoria Center and the MIS Department are serving more than 4,000 monthly, and the waiting lines continue. Ninety-eight years after its opening the need for an addition to the beautiful Renaissance-styled research library, suitable to house the library's collections, has become evident. In a city where its museum, historical society, ballpark, and soon-to-be sports arena are being renovated or built, the time has come for a new central research library. Founded in 1909 under the directorship of the library's John Cotton Dana, the Newark Museum quickly grew into the state's leading museum. In 1999, it marked its 90th anniversary. The museum's attention to its collections and its fine building soon earned for it a reputation as one of the nation's finest. Over the course of nearly a decade, the museum has developed collections covering a wide range of subjects—a great Asian collection including the world-famous Tibetan collection; its American art collection, Decorative Arts materials, African, the Americas and Pacific collection; its numismatic collection, and its natural science collection. Its exhibitions are world-famous, and its emphasis upon educational programming and the forging of public-private partnerships has been extraordinarily successful. In 1976, plans were announced for a massive renovation of the entire museum complex with the creation of 66 new galleries at a cost of $23 million. The work included the new 300-seat Billy Johnson Auditorium, Engelhard Court and the South Wing Education Center. In 1992, the museum received the American Institute of Architects Honor Award. The oldest cultural agency in New Jersey and Newark, the New Jersey Historical Society had a variety of downtown locations before moving to its longtime home at 230 Broadway, and then to its new and present headquarters at 52 Park Place, a block south of the New Jersey Performing Arts Center. The society's new home is in the 1926 building previously occupied by the Essex Club, a private businessmen's club which closed in 1989. The club's former residential wing had to be rebuilt for library and museum use. And although considerable changes were made in the original building, the Georgian feeling of the interior has been retained. Upon entering the society's building you see an oval reception room. The former Grill Room is now a meeting space. The second floor galleries have been the site of major exhibitions. York Hunter, a neighboring company, served as the contractor. Ford Farewell Mills and Gatsch of Princeton were the architects. The building's third floor now is devoted to children's programs, and the fourth floor is now divided into staff offices. The tournament squash courts are now the library stacks. With such facilities, the organization is ready for the next 100 years. Designed by Allen Trousdale, president of the Grad Partnership, this 20,000-square-foot building at West Market Street and King Boulevard is named for the late Clara E. Dasher, the longtime chairwoman of the college's trustee board. The aim was to make the center a 'focal point and entrance to the college by combining a dynamic structural design with a form symbolizing a place of meeting and festivity through recall of the great 19th century revival meeting halls and tents.' The $8 million building, dedicated last year, consists of large glass walls which extend the college into the community—an ultimate outreach exercise. The building is designed to be flexible and contains eight lounges, meeting rooms, a bookstore, cafe, and snack bar, game room, student government offices, administrative offices and art gallery and lobby entrance. Flexibility is a key ingredient of the building, and attention to the individual's needs at the college is high on its list of priorities. One of Newark's most visible remnants of its industrial and commercial past is a former Prudential warehouse at King Boulevard and Warren Street. It was constructed in 1916, acquired by Rutgers University in 1973 and is now under reconstruction in phases. The 117,000-square-foot warehouse, which houses the Rutgers-Newark visual and performing arts programs, is undergoing a $5.5 million facelift which includes a new exterior facade and various interior improvements. The facade is being completed with panelized precast concrete and elegant large tripartite windows which have changed the entire image of the building. The specialized window treatment has turned the building from a warehouse into a palace in University Heights. Again, Allen Trousdale of Grad was the designer. One of the most ambitious rehabilitation projects of recent years in Newark or New Jersey was the conversion of Prudential's Cass Gilbert-designed Gibraltar Building by Allan Trousdale. The cost of the 200,000-square-foot conversion was $24 million. The 15-story downtown landmark, known as the 'Gib' at one time was slated for demolition. Now it is one of the city's centerpieces of architecture, housing the Superior Court of New Jersey's 18 courtrooms, detention facilities, judges chambers, jury rooms, conference rooms, offices for administration staff, offices for the family division, special civil part, the child support unit and a host of ancillary support facilities. This building, home to one-third of the federal courthouses in Newark, is another project designed by Allen Trousdale. The $52 million building—350,000 feet of space in a neoclassical design—is in downtown Newark at Federal Square. The center of the building consists of a five-story rotunda. The building includes 17 courtrooms which can be expanded to 24 if needed. Included in the complex are the bankruptcy, magistrate and district courtrooms, each richly decorated with coffered ceilings, cherrywood and marble accents. A state-of-the-art security system operates throughout the building under the control of the U.S. Marshall Service. Private chambers of the judges are individually designed, and a tunnel connects the new courthouse with the old one across the street. A large landscaped plaza lies between the buildings. The 475,000-foot office tower and 450-car parking garage was completed in 1989 by the Port Authority of New York and New Jersey and the Newark Economic Development Corp. at a cost of $70 million. It was designed as part of an office plan which eventually would consist of 1,000,000 square feet and include a hotel, conference center, outdoor plaza and waterfront promenade with a 1,500-car garage linked to Pennsylvania Station by pedestrian bridges or skywalks. The triangular, flat-iron shape of the building was dictated by the location of major roadways and underground utilities, which had to be built over. The building's granite base is designed to relate to the adjoining Pennsylvania Station, and the pink and blue glass curtain walls reflect the massive building complex to the south of Gateway Center. Much of what is happening in the adjoining building is reflected in the legal center's exterior walls. Howard Horii, a partner in the Grad architectural firm, was the designer. Newark Center is located at one of the city's busiest intersections and includes not only prestigious office space but also the Seton Hall University Law School and the Newark Club on the top floor, with unparalleled views of Newark and New York City. Attached to the main building is a massive multilevel parking facility. The law school provides facilities for 1,200 students, lecture halls, seminar rooms, a moot court and an auditorium for 350 people. Its library contains facilities for 600. The school also provides community services for the poor known as the Law Clinic. A 40,000-square-foot research laboratory completed in 1988, this building with its towers and unusual brick patterns was the first of the modern buildings at King Boulevard and Warren Street. The center is a consortium of the New Jersey Institute of Technology, Rutgers University and Stevens Institute. The new laboratory was the first facility in the country where every aspect of hazardous and environmental waste mitigation and management could be carried out. It contains 12 different laboratories. The use of multicolored brick patterns is designed to relate to the adjoining diverse buildings. Mutual Benefit was one of Newark's oldest and most respected companies, from its founding in 1845 until its demise in 1999. Established when Newark had a population of only 25,000, it grew into a national institution. During its illustrious lifetime, it had six different headquarters in the city. The Broad Street building opened in 1957. 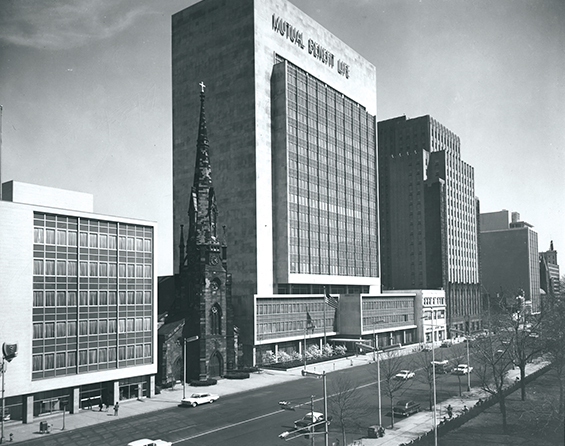 The present building at 520 Broad St. represented the first post-war decision of a major company to rebuild in Newark. The purchase of the Mutual Benefit Building by the Kushner Company of Florham Park, and its recent lease to the IDT Corp. again breathes life into Newark in much the same way that Mutual Benefit did in the late 1950s when the city's future was veiled. The 20-story, 400,000-square-foot building, with its 1,000-car parking lot, remains a major office space in the city. The Firemen's Insurance Company site at 8-12 Park Place is a 10-story building, constructed in two parts. The first section was completed in 1924-25, while the tower was finished 1927-28. The building was purchased in 1989 by Miles Berger of the Berger Organization and is currently being rented to several commercial tenants. This building, on the State and National Registers of Historic Places, has been called one of the finest Georgian-style commercial buildings in town. The insurance building was designed by Newark's famed architectural team of John and Wilson Ely for the old Firemen's Insurance Company, which was at its commercial zenith in the early 1920s. The building's Corinthian columns and portico are among the finest in Newark.